Boardwalk, Park Place, and even Marvin Gardens are all iconic properties on the world's most popular board game. But what if you wanted to play a game of Monopoly with locales you were actually familiar with? A simple Sharpie is one solution, but so is Hasbro's My Monopoly game. It lets you create a custom board online—with graphics and properties of your choosing—that's then delivered right to your door. 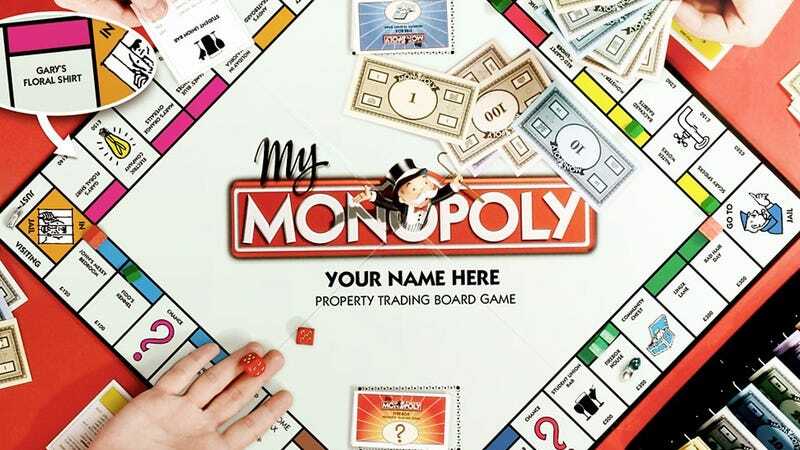 At just north of $130 you're going to pay dearly for the privilege of a custom-printed Monopoly game that doesn't look like you made it yourself. But when you think of the awesome potential here—like buying hotels on Poop Place, or taking a ride on the Flatulent Railroad—it's clearly worth every last penny.